Crescent Apple Cinnamon Rolls are easy to make and are served with a Homemade Caramel sauce. 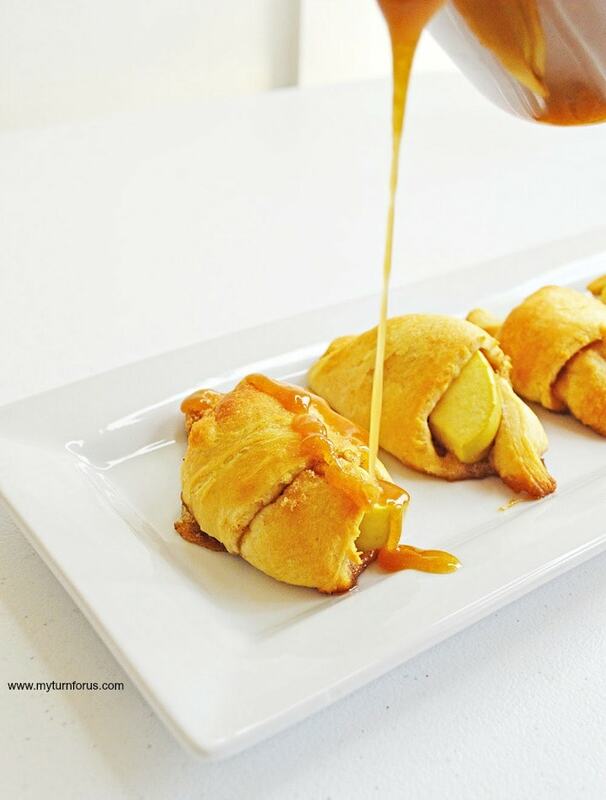 It’s a simple Cinnamon Apple bites recipe that’s made from crescent dough, apple slices, and cinnamon to make the best Apple roll-ups. 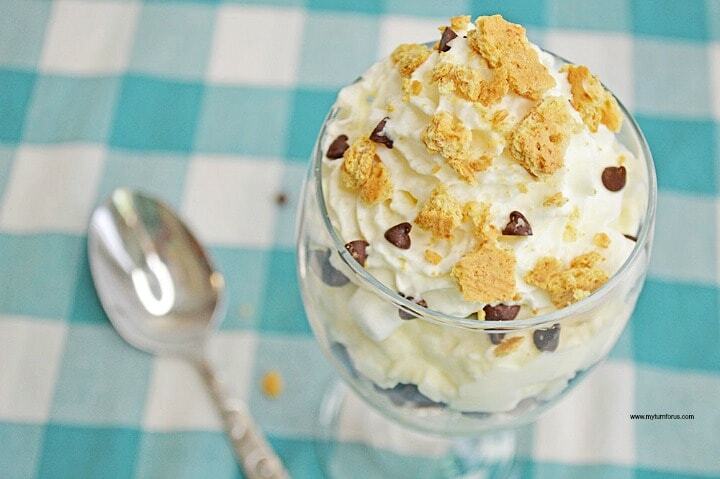 Sometimes you want just an easy snack or dessert idea. 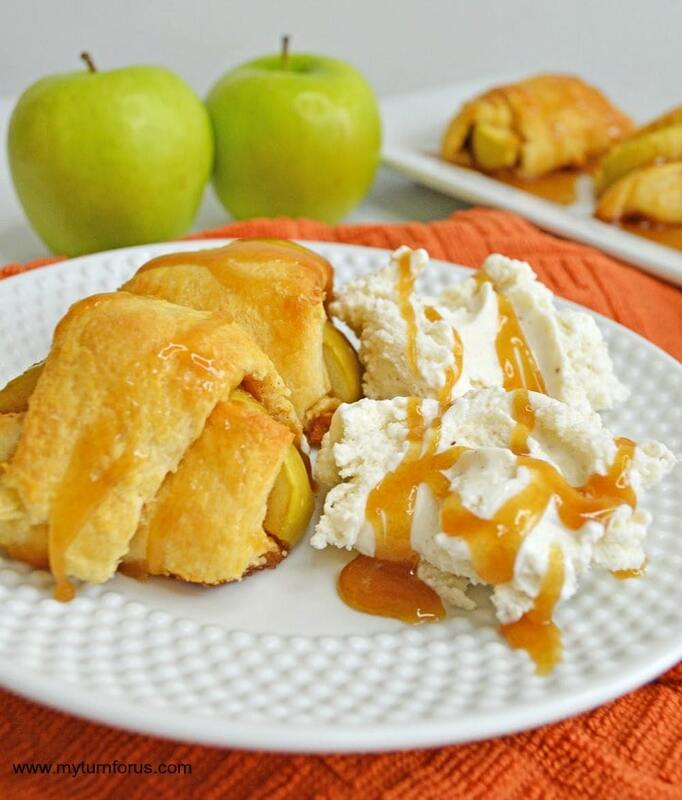 Our Apple Cinnamon Rollups are amazingly easy and ready in a jiffy. They are about one of the easiest Cinnamon Apple Bites recipes around. 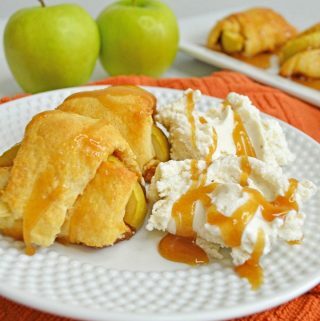 These Easy Apple Roll-ups just make my mouth water, it’s like your very own bite of apple pie. 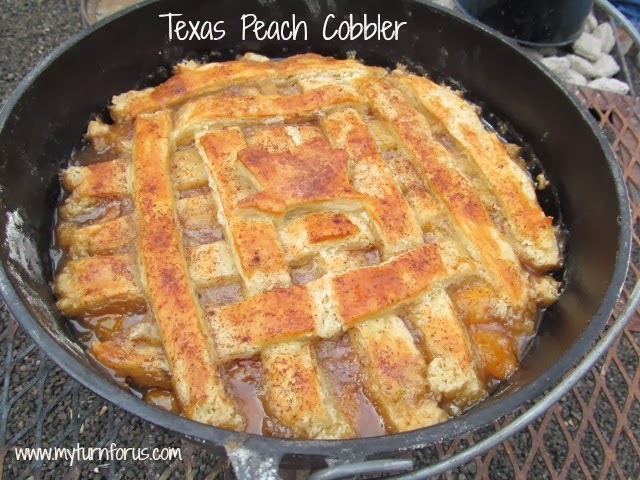 And who doesn’t like apple pie right? These snacks can be ready to eat in about 30 minutes with a limited amount of work. 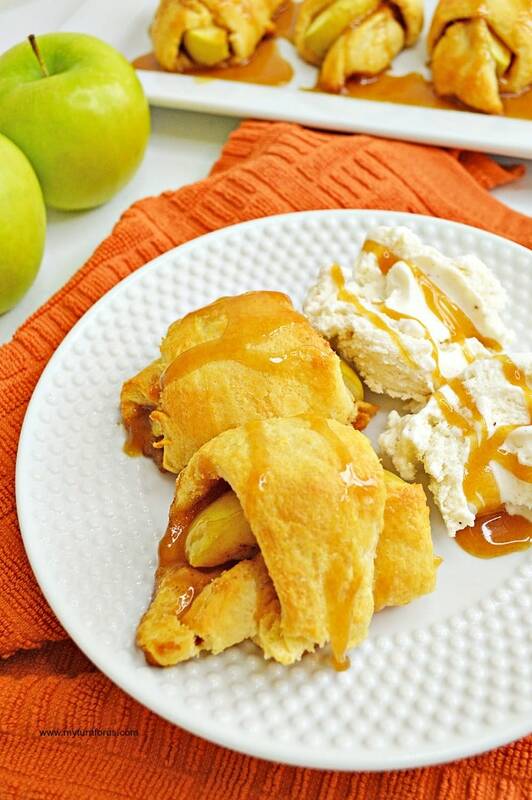 We started these Apple Pie bites using crescent dough and rolling out each little piece. We topped it with a sugar, cinnamon, and nutmeg mixture similar to making cinnamon rolls. We even used parchment paper to make our cleanup easy. We sliced an apple into eight wedges using an apple slicer. Then we topped our dough with the apple slices and rolled up apple slice in the dough to make apple roll-ups. Drizzled our sauce over the top of these flaky apple cinnamon rolls. 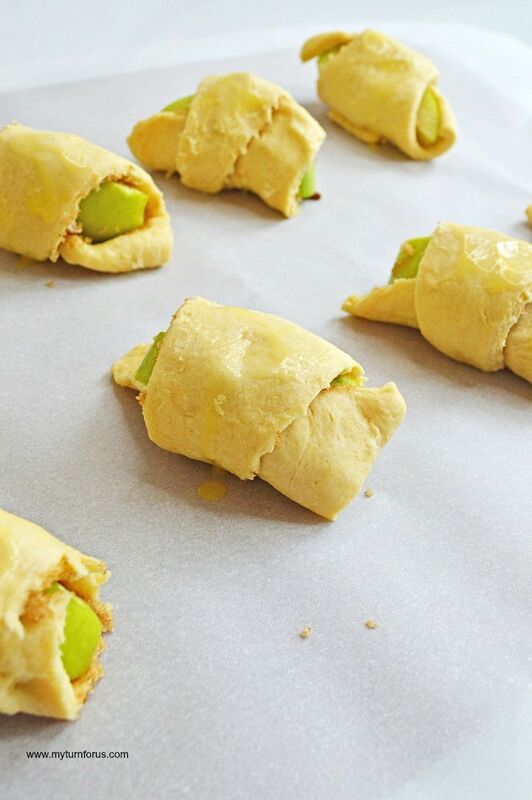 These little apple Roll-ups are served as soon as they come out of the oven. If you notice, we called these delicious snacks by several names like Apple Roll-ups, Crescent Apple bites, Apple Cinnamon roll-ups and Cinnamon Apple Bites. What would you name them? Preheat your oven to 375 degrees. Line a baking sheet with parchment paper, set aside. Lie down a sheet of parchment paper on the counter. Roll out each of the 8 crescent rolls individually. In a small bowl, whisk together brown sugar, cinnamon, and nutmeg. 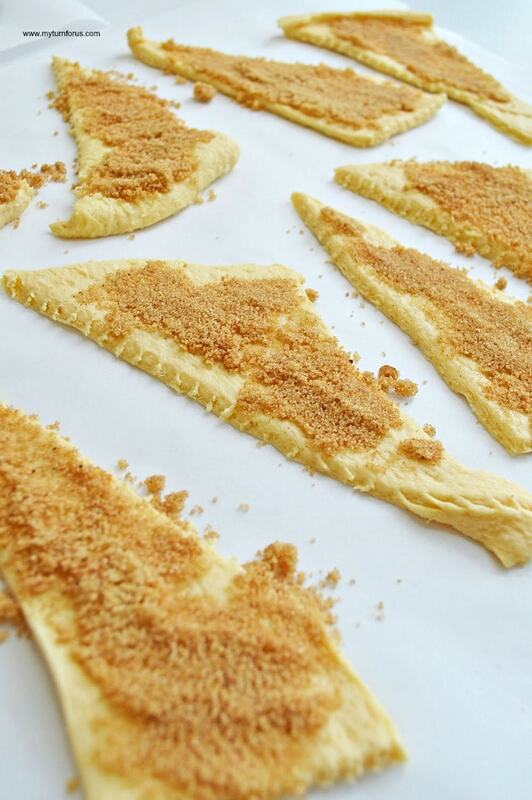 Add 2 tbsp of the cinnamon sugar mixture to each crescent and layer it evenly. Divide the chopped pecans evenly between the crescents. Take the apple slices and toss them in the melted butter. 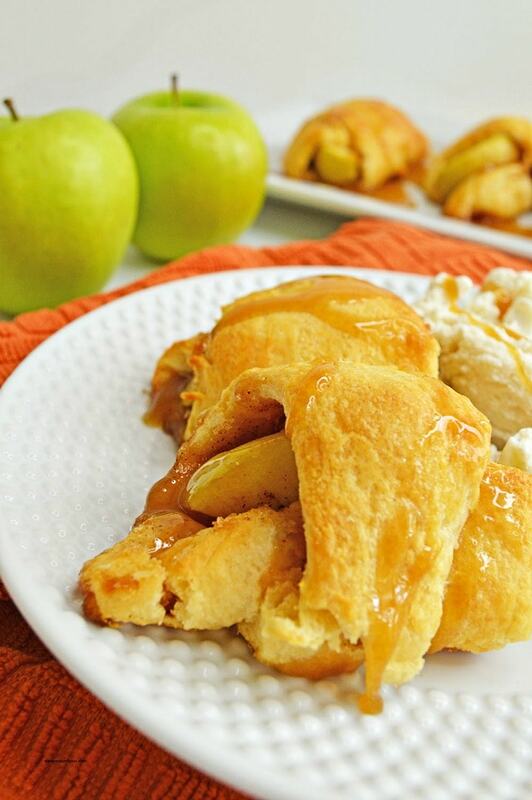 Add one apple slice to the wide end of your crescent roll, and roll it up towards the narrow end. Repeat for the remaining rolls. Brush the tops of the rolls with melted butter and place onto your parchment covered cookie sheet. Bake 9-10 minutes until crescents begin to turn golden brown. Drizzle with homemade caramel sauce, and serve with vanilla ice cream. In a small saucepan, bring brown sugar, butter, and milk to a boil. Cook for 1-2 minutes, stirring constantly, until the caramel thickens. Remove from heat and stir in vanilla.